Front row (left to right): 1. unidentified, 2. unidentified, 3. Clarence Pierce, 4. unidentified, 5. unidentified, 6. Ronald Silcocks, 7. unidentified, 8. unidentified, 9. unidentified. Second row: 1. unidentified, 2. Barbara Rogge, 3. unidentified, 4. unidentified, 5. Linda (Joy) Bodenhausen, 6. Diana McGregor, 7. unidentified, 8. unidentified. Third row: 1. unidentified, 2. Robin Morningham, 3. unidentified, 4. Willa Worley, 5. unidentified, 6. unidentified, 7. unidentified, 8. unidentified. Fourth row: 1. unidentified teacher, 2. unidentified, 3. unidentified, 4. unidentified, 5. unidentified, 6. unidentified, 7. unidentified, 8. unidentified, 9. unidentified, 10. John Regas. Credits: From the collection of Ron Silcocks. 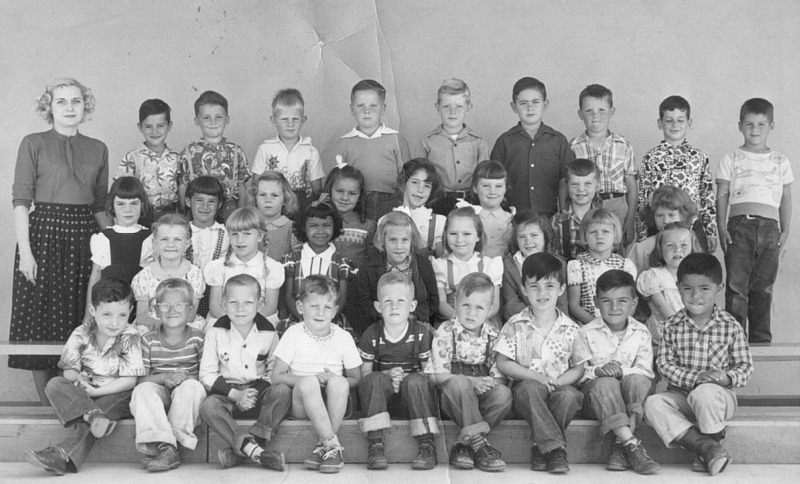 Thanks to Ron Silcocks, David Smith, and Robert Mills for identifying the kids in this picture.